The 2005 Yamaha Big Bear 400 4x4 is a Utility Style ATV equipped with an 386cc, Air / Oil Cooled, Single-Cylinder, SOHC, 4-Stroke Engine and a Manual / Automatic Clutch Transmission. It has a Selectable 4X2 / 4X4 driveline. The Big Bear 400 4x4 has a Independent Double Wishbone Front Suspension with 5.9 inches of travel while the Swing Arm Rear Suspension has 5.9 inches of travel. The Big Bear 400 4x4 has Front Dual Hydraulic Disc Brakes and Rear Sealed Drum Brakes. The Big Bear 400 4x4 was introduced in -10019- and is Carryover for 2005. It includes a 6 month -20012- warranty. The base price of the 2005 Yamaha Big Bear 400 4x4 ATV is $5199. This is $77.78 less expensive than its competition. The Single-Cylinder engine in the 2005 Yamaha Big Bear 400 4x4 ATV has a displacement of 386 cc which is 3.66% more than its competition. 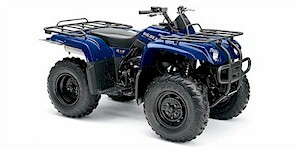 The 2005 Yamaha Big Bear 400 4x4 ATV weighs 556 lbs which is 3.42% less than other Utility models. 6. 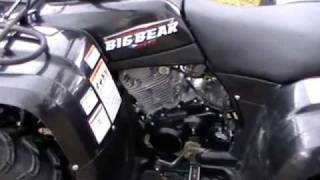 Yamaha BIG BEAR 400 Review. The best ATV for the mountains( NC). It is the best climbing four wheeler I've ever seen. I have never seen a hill a good driver couldn't climb with this. ( I mean straight up, 90 degrees). It's not fast nor one to play with. It's a serious machine made for working and hunting. I have hauled many 1,000 pounds with it before and rescued many grizzly's in tough terrain. It shine's in tight and tough woods. 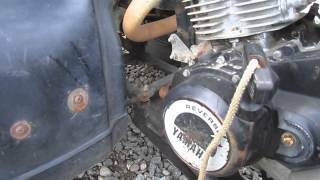 How big is the 2005 Yamaha Big Bear 400 4x4's engine? 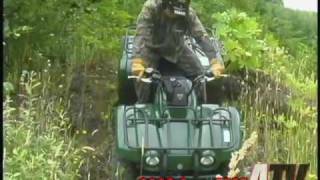 How much is the 2005 Yamaha Big Bear 400 4x4? Has the 2005 Yamaha Big Bear 400 4x4 won any awards? Does the 2005 Yamaha Big Bear 400 4x4 get good gas mileage? How big is the 2005 Yamaha Big Bear 400 4x4? How much does the 2005 Yamaha Big Bear 400 4x4 weigh? How fast is the 2005 Yamaha Big Bear 400 4x4? 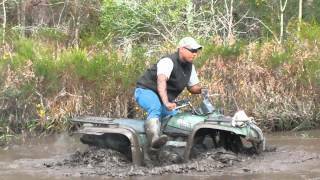 What is the cheapest price for a 2005 Yamaha Big Bear 400 4x4? 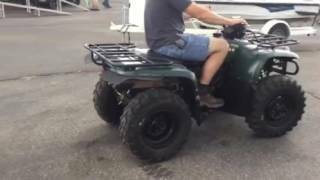 What is the dealer cost/invoice price for a 2005 Yamaha Big Bear 400 4x4? 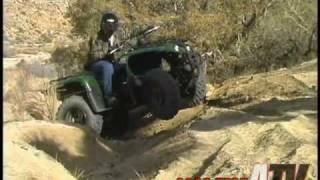 What models compete with the 2005 Yamaha Big Bear 400 4x4? 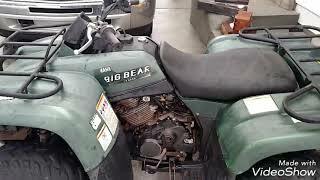 Where can I view classifieds and search for a used Yamaha Big Bear 400 4x4? What makes the 2005 Yamaha Big Bear 400 4x4 different from its competitors? 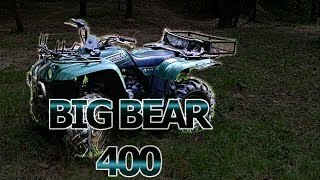 Where can I find parts and accessories for the Yamaha Big Bear 400 4x4? 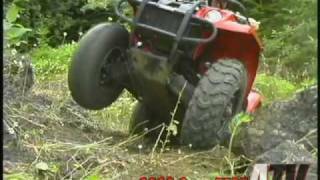 Where can I find 2005 Yamaha Big Bear 400 4x4 videos? What are the current incentives, sales, or promotions for the 2005 Yamaha Big Bear 400 4x4? How do I view a Yamaha Big Bear 400 4x4 brochure?